Have you ever tried to do some exercise with real exercise / fitness music? Lynne Publishing, the company behind 1SoundFX.com have today launched a new service: Workout Music Series - a whole new range of music products made for use with fitness and exercise. Everybody knows that exercise is good for you and everybody should be doing it. But sometimes we need some motivation. We need a little help and we need something to make it more fun. You can buy yourself some new exercise equipment, hook up with friends and exercise together with them - or, you can put some really great motivational exercise music in your iPod or MP3 player, and feel the excitement and motivation take off! The Workout Music Series is essentially a collection of music albums that each play for one hour non-stop. 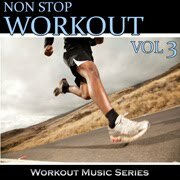 Thus the titles: "Non Stop Workout", vol 1, 2, 3 etc. Each of these CD's (albums) are made as a continuous remix of 10-12 different tracks, playing in a "gapless" way where one track simply continues into the next one without any stop or gap between. Simlar to how a DJ in a nightclub might mix the evening's dance music. This music is really great for use with exercise and fitness classes, for fitness videos or simply for listening to while you're doing your fitness routine, to give you an extra edge and to make it more interesting and fun to work out. Whether you're into running, bicycling, aerobics, dancercise, boxercise or even weight lifting, this music will definitely be a great addition to your routine. Each album in the series can be purchased for personal-use only at prices around $9.99, or in a different type of purchase that includes a royalty-free music use license. This purchase is around $49 and it includes a legal license that allows you to use the music in-public (for example, for group exercise classes), or in media (for example, in a workout instructional video).